This beautiful wedding invitation set features two pretty butterflies and flowers in shades of red, orange, green and brown. It is great for summer, early autumn and any butterfly themed wedding. 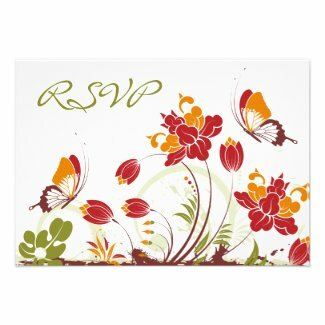 This invitation collection includes RSVPs, reception cards, save the date announcements and a few custom postage stamps. Each is available separately below. Select any item to view additional details and edit. 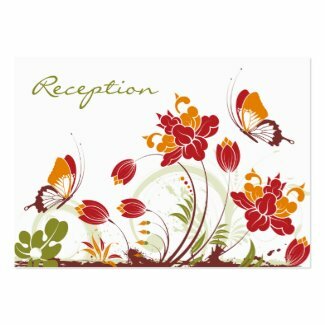 For additional invitations and stamps take a look at Beautiful Butterfly Wedding Invitations and Butterfly LOVE Postage Stamps.